This morning I responded to a prospective client who is weighing bringing me onsite to teach So Now You’re a Manager to their leadership team. Managers cannot successfully lead unless they see themselves as leaders. So the first thing we’ll do is leadership mission statements in which all managers in the room must craft their own interpretation of managing and leading. Then they share them with the room. This is important because it’s the first step towards OWNING the experience of managing and leading and publicly interpreting that for their peers. This action will help with #2 and #3. 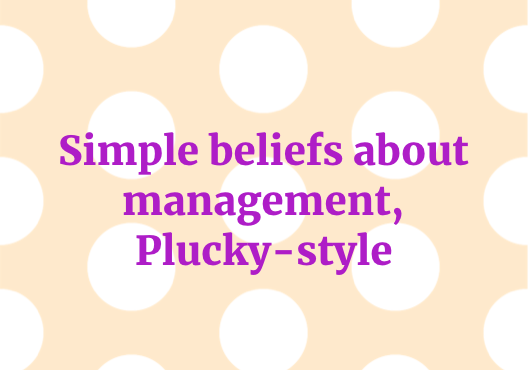 Then we’ll build on the concept of what the heck management is (short story: I believe all managers have a double major. Building trust and finding opportunities. That’s it. If they ONLY take this away from our time together, it will be a big win). Building trust and finding opportunities look like a number of tactical things (1:1s, tracking resources’ paths, listening closely at leadership meetings, meeting with peers, sharing appreciation and reward systems). This portion of our time together will help with #1 and #4. And regarding #5, I’m sure I’ll say this 10x/day while we’re together, but life is a giant science experiment. TRY THINGS! You must be willing to try things, assess and adjust as managers. This belief is my entire vibe in the room, I will encourage people to practice elements together, I will endlessly brainstorm with you all about what hasn’t been working and pull new ideas and experiments out of you. Fundamentally I believe managing is like parenting. You never graduate. You will continue to hone these skills for your entire career – delegation, patience, managing UP, building trust, etc. Even if you get decent at one in Q1, you may struggle in Q3 because the humans you are working with and for will evolve! They’re like moving targets. 🙂 But with awareness and intention, commitment and a peer group of folks who are also managing alongside you, managing is incredibly rewarding and growing and the years of experiments and anecdotes they build up will make really fascinating and stretching careers for them all. Does this sound like something your org needs? Send me your managers! There are still spots open for So Now You’re a Manager, Philadelphia edition on March 22-23, 2018. I would love to help empower your leaders and send them back with some GUMPTION! And tools!